Summer Wars is the second movie by Mamoru Hosoda of The Girl Who Leapt Through Time fame. I wasn’t expecting it to be my favorite movie of the week after I watched it, but it’s grown on me and I like it even more in retrospect. 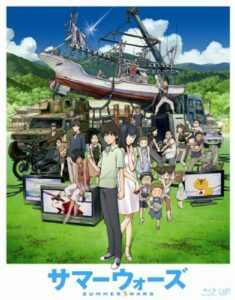 Kenji Koiso is a quiet high school student and math prodigy who is minding his own business when a school-mate asks him to travel to a remote town and accompany her to her family reunion to help with some things. It turns out that the thing she wants help with is pretending to be her fiancé (of course, it’s an anime). But they soon have bigger problems when an unknown hacker attacks the virtual world that much of the world’s infrastructure depends on and Kenji is framed for it. Summer Wars is both cyberpunk and slice-of-life family drama and I never thought those two genres would be combined and even if they were, I didn’t think it would work so well. The movie is set in a rambling old estate and the scenery is gorgeous, but the virtual reality is a complete world as well. And all of the characters seem equally at home in both worlds. The family reunion scenes were painfully accurate and even though there were dozens of characters I never felt lost. The main arc of the story is a little predictable but who watches movies for the plot? Billy Crudup plays the grieving father of a college student who finds demo tapes of the music his son wrote and ends up forming a band. Rudderless is William H. Macy’s directorial debut and I’m looking forward to seeing more films from him; I thought it was a very poignant movie. Original music for a movie usually isn’t that memorable, but the music was consistently great – I would buy their CD. Billy Crudup shines in his role which is a good thing since the movie revolves around him (he has apparently stuck with the guitar since his role in Almost Famous). His primary band-mate is played by Anton Yelchin; he’s delightful as always but seeing him in a movie about the death of a young man was sad. Grady Tripp (Michael Douglas), an English professor and writer, is having a pretty bad day – his wife leaves him, he finds out that the chancellor of the university (Frances McDormand) is pregnant with his child but she’s married to the head of his department, his editor (Robert Downey Jr.) is in town to check on the progress of his manuscript, and one of his students (Tobey Maguire) just committed a crime that he’s an accomplice to. Wonder Boys is based on a Michael Chabon novel and it’s an excellent quirky character drama. I’m not sure why it’s not more well known – I only found out about it because the “Satan’s Alley” fake movie trailer in Tropic Thunder (starring Robert Downey Jr. and Tobey Maguire) was based on their roles in this movie. It’s got heart, it’s funny (especially to me because I knew a few English majors at Oberlin), the cast is terrific. We watched this movie after Room because we really needed something else to watch to recover from how uncomfortable it was, and The Song of Lunch was less than an hour long. It’s an adaptation of a poem about a man meeting an old flame for lunch, starring Alan Rickman and Emma Thompson. There’s not much dialogue, Alan Rickman reads the poem (it’s a monologue from his character’s point of view) as the scenes from it are acted out. I was skeptical of the whole concept, I thought it would be too artsy, but it was actually great. Alan Rickman and Emma Thompson can do no wrong and they knock this one out of the park. I’ve been simultaneously dreading and wanting to watch Room for a while. Five-year old Jack and his mother Joy have been confined to a single shed for all of Jack’s life; his mother was kidnapped when she was 17 and imprisoned ever since. Joy is determined to give him as normal of a life as she can and lets Jack believe that Room is the entirety of the world with every object in Room having its own story. Eventually they escape but adjusting to the real world proves to be harder than they thought. Room is a good movie but it’s really depressing, it does a good job of making you uncomfortable. Some of the things the characters did didn’t make sense to me, but it told a coherent story and balanced whimsy with the horrendousness of its situation well. I’m glad I watched it but I never want to see it again. A diverse group of teenagers decide to break into the company that administers the SAT to steal answers for their upcoming retest. Along the way they realize that there are more important things than SAT scores (like finding someone to date). This movie is pretty predictable, but it’s got a good cast that includes Chris Evans and Scarlett Johansson (now I know why Captain America and Black Widow get along so well in the Marvel movies; they apparently stole SAT questions together). It’s definitely trying to echo Breakfast Club vibes but it’s nowhere near as good. If you’re a fan of teen movies, definitely watch this, but if you’re someone that just watches a movie every few weeks, it’s probably not worth your time. As a fan of fantasy, I was really excited about watching this movie – a post-apocalyptic world that’s being terrorized by dragons, Christian Bale, and Matthew McConaughey! Christian Bale plays the leader of a small settlement that’s just trying to survive, an impressively buff and head-shaven Matthew McConaughey plays the leader of an American military expedition to wipe out the dragons’ ability to reproduce. The movie just wasn’t very good, it was passable as a alien-invasion/monster type movie, but it did nothing unique with its premise at all – the worldbuilding was practically non-existent. Plus the characters weren’t very believable, they seemed to be driven entirely by what the plot needed them to do. When motorcycle stunt driver Luke Glanton (Ryan Gosling) finds out he has a son, he’s determined to provide for him, even if it means robbing banks. Eventually he ends up in the path of rookie policeman Avery Cross (Bradley Cooper). I think saying any more than that would be a spoiler, but even though The Place Beyond the Pines is about a criminal and a cop, it’s more like an epic family drama than anything else. It probably doesn’t deserve to be at the bottom of my list this week but I felt a little betrayed by it because it started off so well; it pulled me into its world and the mood it was setting. It reminded me a little of Drive or Hell or High Water – both of which were flat and not very dramatic, relying on their atmosphere and characters to make you care. Unfortunately, by the end, I felt like I was watching a soap opera and the movie’s tone seemed more pretentious than anything else. The acting was impressive though and I enjoyed the cinematography.